Since this issue of EAR CANDY has Elvis as one of the themes this month, we were surprised to find an organization called PEIA (Professional Elvis Impersonators Association). Elvis impersonator, Johnny Thompson, founded the organization. Although we didn't get to catch a performance by Johnny during our stay in Vegas, we thought it would make an interesting interview. E.C. : What led you to form the PEIA (Professional Elvis Impersonators Association) and what is the primary goal of the organization? I've heard that Las Vegas hosts a huge Elvis convention of impersonators. Is PEIA connected with that? Johnny: Well, I originally came up with the idea for the PEIA back in 1998 when I founded the Elvis Entertainers Network. It took me a couple of years to put together the guide lines and goals for such an organization. What we try to do more than anything is promote good will and brotherhood amongst all Elvis Tribute Artist and Impersonators. I have also tried to add benefits such as travel and costumes discounts to our members. I designed this organization to be beneficial to all its members not just a select few like most agencies tend to do. Some members have reported a 60% increase in performance request since they have signed up! Our other goals are to present a positive and professional image to the general public. We are having our first International Convention at Lady Luck Casino Hotel in Las Vegas June 7-9. We are bringing in over 20 impersonators from around the world including England, U.S., Japan, Philippines and Canada. We have added special guest who worked with and knew Elvis. E.C. : You have a background in acting correct? What do you enjoy more-acting or doing Elvis? Or do you see a distinction between the two? Do you consider acting your main occupation? Johnny: I was trained as an actor in school and from private coaches for years. I've worked with some of the best names in the business in live shows, commercials, and films including Halle Berry, Claudia Schiffer, Alan Thicke, Jim Belushi to name a few. 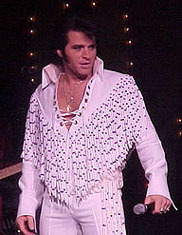 I see that portraying Elvis is very similar to performing on stage as any other character. Of course I sing as well so there is another eliment added to the stage show. I was recently cast as Elvis in a Sci-Fi original TV Series "The Chronicle" and have starred in two documentaries on Elvis Impersonators. E.C. : How exactly did you get into doing Elvis impersonations? Was it merely by accident, or was it part of your plan as an actor? Were you an Elvis fan growing up? Johnny: I have always been an Elvis fan as far back as I can remember. My father was a huge fan and had the chance to see him in person in Ft. Worth Texas, were I was born. I began performing as Elvis by performing singing telegrams and private parties and events throughout Chicago, Indian and Wisconsin. Eventually that lead to contest, corporate events and conventions. From there I began touring the US and Japan. More or less it was by accident, I just happened to be in the right place at the right time. E.C. : Where do you live and where do you perform (as Elvis) the most? Johnny: I currently live in Las Vegas, Nevada and I perform at the Elvis-a-Rama Museum theater, the Frontier Hotel and Casino and at corporate events and trade-shows nationwide. On average I perform about 25-30 shows per week. I also run the PEIA and work for several agents from around the country. E.C. : How do you study for the role of Elvis? Is it basically watching the films? Does a background in karate help? I also imagine that you videotape some of your performances to critique them yourself? How much practice is involved in Elvis impersonation? Johnny: I have 4 black belts in different martial arts and that has helped with my stage movement and postures that Elvis does on stage. I have spent hundreds of hours watching video tapes and learning his mannerisms, voice inflection, laugh and the way he responds to his audience. Watching yourself on tape is an eye opener and can help you work on those things you need to improve on. I know lots of guys who never watch Elvis and make up there own moves and it really ruins the impersonation. If they would only take the time to break down things systematically, they could greatly improve there performance. They worse things a guy can do is try to throw in Karate moves where Elvis never did the moves. Or worse still, try to do high kicks when they cant even kick above their belt level. E.C. : What music do you listen to in your spare time? Johnny: I like all types of music Pop, Rock, Blues and Country. Lately I've been involved with working with some legendary Rockabilly artist. Im working with Glen Glenn Troutman who has played with Elvis, Johnny Cash, Ricky Nelson, Marty Robbins, Buddy Holly and many others. Rockabilly is the Grandfather of all Rock and Roll. Elvis was the Grandfather of Rockabilly. E.C. : Since Elvis had an amazing voice, I imagine that one of the prerequisites for impersonating him is to have a good voice. Do you see this is the point of distinction between an “average” Elvis impersonator and a really accomplished one? What do YOU think makes a good Elvis impersonator? Johnny: First off you must have a good voice. If you don't know how to sing, not matter how much you look like Elvis it wont matter. I've had several voice coaches when I first started out. I had to learn to expand my range and breathing. Now I can hit notes I never thought possible. Its been a hard road, but after all the years of training and performance its all coming together. too many guys too have a good voice, but don't sound a thing like Elvis. Why they go into singing Elvis and doing Elvis Impersonations Illl never know. But Id rather hear a guy with a good voice sing Elvis than a guy who sounds like Elvis but can't sing or hit the notes. E.C. : Why do you think Las Vegas has become such an Elvis “Mecca”? I mean, there is probably more Elvis impersonators in Vegas than there is around Graceland. Johnny: Well, I lived in the Memphis area last year for about 5 months and there are only about 3 Elvis Impersonators in the whole city. Vegas has bout 12 Elvis shows up and down the Strip that I know of. And about 10 guys that do nothing but work for wedding chapels. There are probably more guys than that, but not that work full time. Vegas is a fun city, people expect to see Elvis here. I guess guys just go where the demand is. Its very hard to get into a show here or get steady work if you aren't established before coming here. There is a lot of competition here in Vegas. E.C. : There are tribute bands/impersonators for just about every major rock legend of the last 40+ years, however, I'm sure that the sheer number of Elvis impersonators probably outnumber all the others put together. Do you happen to have a rough guess on the number of Elvis impersonators out there? Johnny: Some say there are 3,000 other say 30,000. Even the Guinness Book of World Records says there are 35,000. But more realistically, there are about 300 working professionals. Less than half of them work full time. E.C. : What advice would you give to any prospective Elvis impersonator? Johnny: Think long and hard before deciding to do this as a career, because its also a life style. You will get joked at or stopped for your picture none stop. People will cheer you and boo you. Its not an easy life, but if you can look past that and can please your audiences, love Elvis music, and have a desire to see how far you can take it, then go for it. E.C. : Do you think that Elvis impersonators get the right amount of respect? Johnny: No. Not by the general public, only by Elvis fans. E.C. : If Elvis was alive today, what do you think he would think of the almost cult-like status that he has achieved? Johnny: I've been told by Charlie Hodge, Al Dvorin and Joe Esposito, all worked for Elvis and were close friends "he would laugh and get a kick out it that so many people love his music and are imitating him." E.C. : How long will YOU be doing Elvis impersonations? Johnny: Im not sure about that. I guess as long as I can please my audiences and people want to see me. Its all up to the fans. E.C. : (Non Elvis question) Finally, do you have any non-Elvis film or music projects coming up? I'm just curious is you have any thoughts of say, recording an album on your own? Johnny: Actually I am working right now with Ronny Weiser at Rollin Rock Records on a deal to produce some Rockabilly music. So I'm hoping within the year to have the CD completed. Then I will tour with the band and play at the Rockabilly Festivals around the nation.